Designed by Ignazio Gardella in 1957, the Digamma lounge chair is a comfortable chair with roots in the late Italian modernist tradition. Its rational construction features two geometric sections - the rectangular upholstered back and seat - bound by a firm upholstered frame. The black metallic legs are finished off with Gardella’s iconic brass ‘duck’ feet. The armchair has a three-position reclining backrest and the matching ottoman/footrest offers additional comfort. This set is a custom version realized by Santa & Cole, upholstered and sewn by hand in a light and subtle turquoise Donghia velvet. A sample of this durable, soft fabric is available on request, please enquire for details. Ignazio Gardella was a member of the so-called third generation of the Modern Movement. He is considered one of the greatest exponents of Italian Rationalism, although he followed its principles in a much more personal way, searching to overcome its limitations. 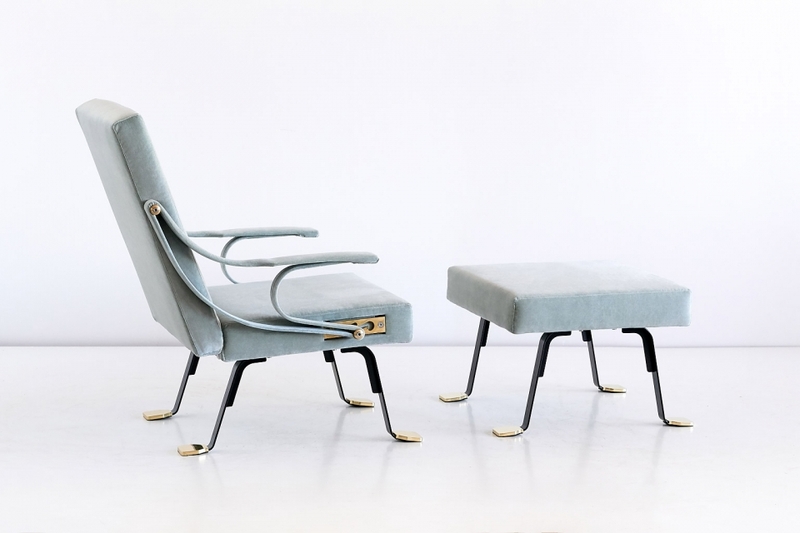 In 1957, he created the Digamma armchair which was produced by Gavina. In 2005 the Barcelona based Santa & Cole has been assigned by Gavina to produce the official re-edition. In this armchair Gardella showed his capacity to join harmoniously elements that belonged to opposite styles at first sight, a common characteristic of most of his works. The armchair and matching ottoman are also available upholstered in customer’s own material, pending the manufacturer’s approval of the specified fabric. Please contact us for more information.